This demo is made on a windows 10 computer. It shows how to interact with a Kube cluster in python and start a simple job on it and wait for the job to end and get its status/logs. The tricky part is to get the logs since the job object do not directly contains the info and thus, we need to get the pod associated with the job and get the pod logs. 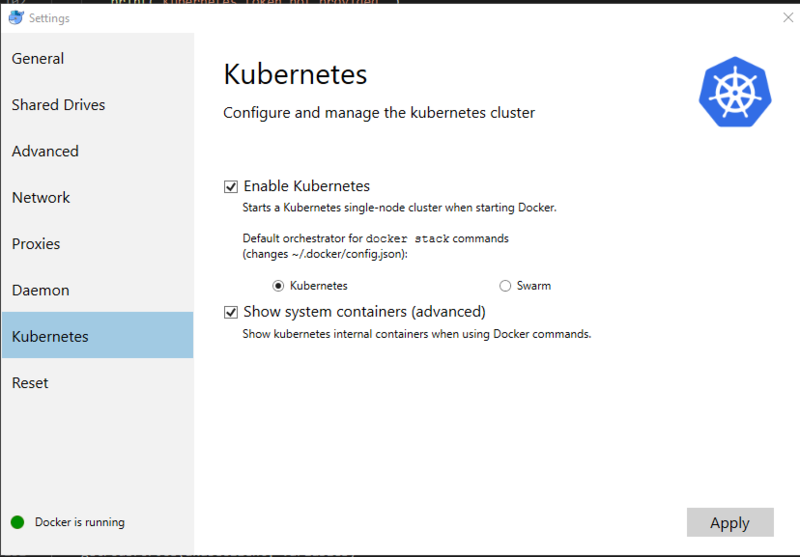 Once the kube cluster is up and running you can interact with it from a terminal (I use PowerShell) that we will call T1 and will be use for the kube server-side interaction. It s base64…decode it in a string and save it. PS C:\Code\kubejobs> docker build -t quicktest . You can also chech the job creation when the python script is running (but not after because job is deleted at the end) from the T1 terminal used before. As you can see, we also print the logs of the job. I use this python script daily when I spawn jobs on a remote Kube cluster from a Jenkins server (my Jenkins jobs are just spawning Kube job on remote cluster and waiting for them to be over). I’m sharing it hoping it can help some ppl. The code is quite simple and the only tricky part is to get the pod associated to the job so that we can get the logs (BTW this may not works in case the job spawn several pods). Often i need to write code for Linux server on a win10 ENV. Before I was using VM (virtualbox/vagrant) but here is my new way to do it. When a Kube cluster is created on Google Kube Engine you have access to a user/password combination that you could use to authenticate with Kube API. 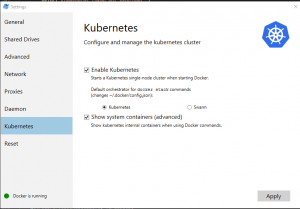 The first issue I had was to specify a remote cluster since all the example of the API used a .kubeconfig and suppose that the kube client is on the server (and usable). It allows me to validate the “remote” cluster communication and also the token authentication nevertheless it is not my final goal. I spend some time digging in the code and did not find any code related to the BASIC auth. I check in the code and the method “get_basic_auth_token” in configuration.py is never call anywhere (and it is the only one dealing with username/password field). Gets Auth Settings dict for api client. :return: The Auth Settings information dict. This confirms that the basic auth can be used (as the kubernetes mentioned) but is not accessible from the python API. 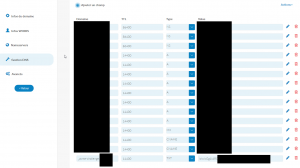 The previous hack allowed me to be sure that I could authenticate with the cluster using the user//password nevertheless we cannot keep such dirty hack. So there is indeed ne reference to any BASIC authentication process here. This is strange since the official doc mention it and since we just validated it works fine. This article is the part 2 of 2 on my adventure of creating plugins for Google suite et MS office suite. The 2 plugins have the same goal which is retrieve the value of cryptocurrency from various exchanges. 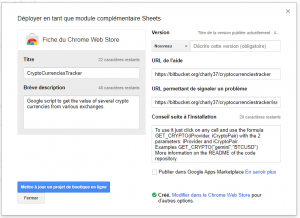 The first article was explaining the plugin creation for Google Suite and is available HERE. 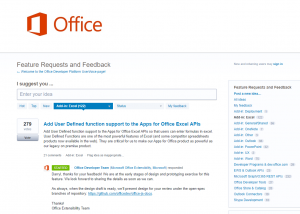 This article focuses on the plugin creation for the Microsoft office Suite. 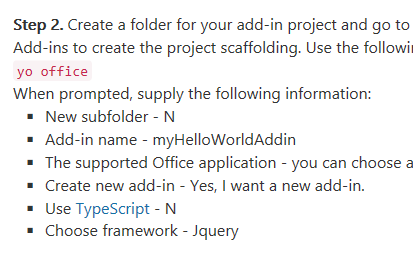 I tried first the Visual Studio solution but I had some issue with the free version (get an error message telling me that I needed a non-free version to create t a plugin) so I decided to go with the option 2 “Other tools”. The other tool solution is a bundle of Web DEV tools: NodeJs and Yeoman. I already have NodeJs on my windows computer so I tried to use it but sadly face some issue due to my ENV (I’m also working on 2 other projects with nodejs specific setup: Meteor and Electron which tune the ENV for their needs). 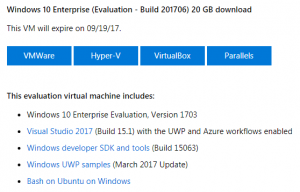 Microsoft offer free windows VM that you can run on VirtualBox with a set of pre-install DEV tools “Start coding sooner with a virtual machine prepped for Windows 10 development. It has the latest versions of Windows, the developer tools, SDKs, and samples ready to go.”. That’s a very nice/smart move from MS and allow a quick DEV env setup without any impact on my windows ENV. The use of the VM is very smooth and this will probably be my default solution for any future DEV I do on windows! I strongly suggest to use it. Once the VM is started you can easily install all the tools needed on it. It may be important to explain here a big difference between a plugin for Google and MS. The google plugin was executed on Google side so we did not have to host anything. Microsoft took a different approach since the plugin will run on our side. It means that we will have to setup a WebServer (thus the bigger footprint of the DEV ENV for the MS plugin) to host the plugin. Then you can start the “empty” project with npm start and access the website. 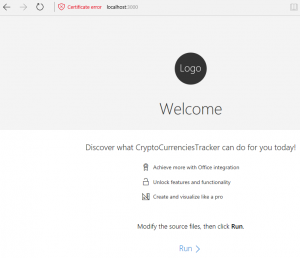 You may notice that the website offers by the plugin do not have a certificate. This prevent you to try it in office online. 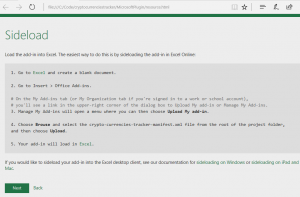 You need to generate a self-signed certificate and use it. This part was a nightmare! I followed all the instruction but it never worked. 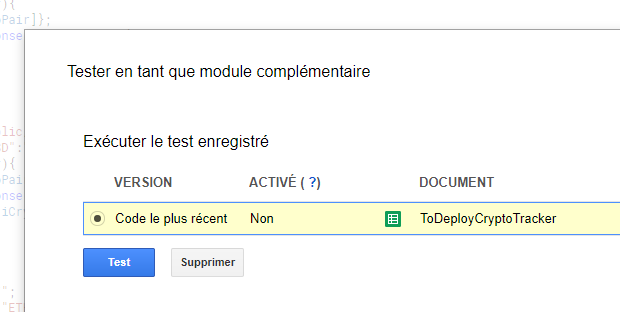 I spend hour investigating on my side thinking the issue was due to my import of the certificate in my brother until I find a ticket open in the project “Running add-in locally no longer works, certificate invalid” (see https://github.com/OfficeDev/generator-office/issues/244). 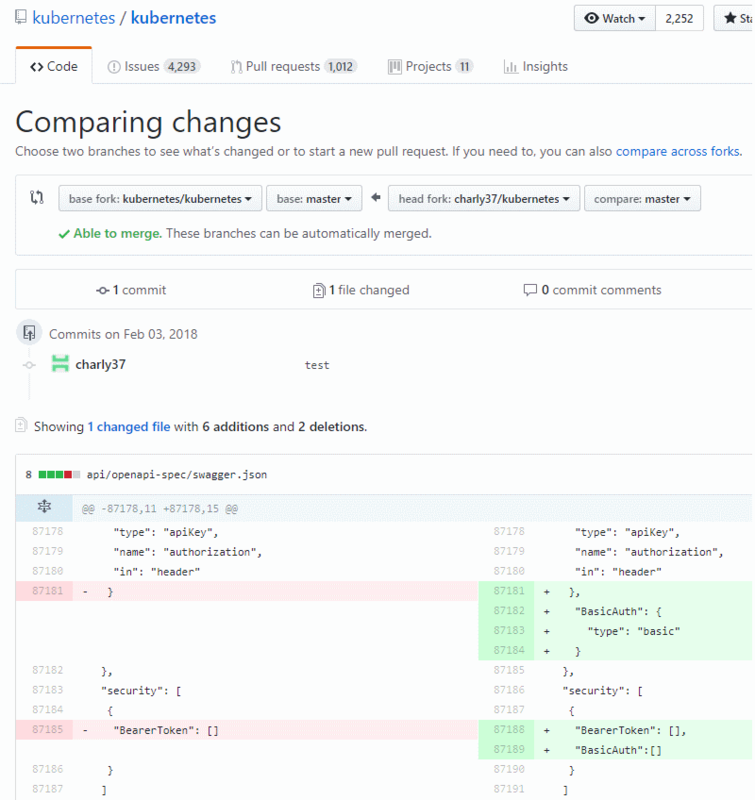 I was so mad that the issue was known but not documented anywhere that I update the README to mention it with a PR (https://github.com/OfficeDev/generator-office/pull/249). I wasted so much time on this part…. Just look at the post to know how to generate the certificate and what to do with it. Once this painful step is done you should be able to see your plugin by opening the URL provided by the generator. Now that the base code is ready we can start working on our plugin. Remember the google plugin? Just few lines of code to do some REST call and then annotate some JS function so that they can be used by the user as formula? Bad news for us. It is way more complicated with Office! 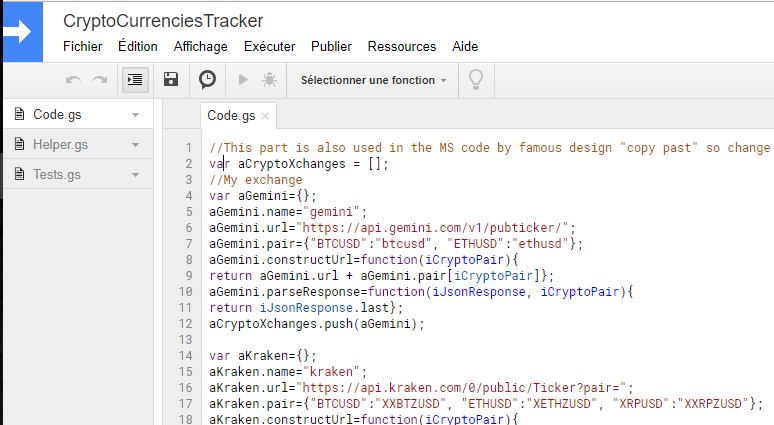 return aGdax.url + aGdax.pair[iCryptoPair] + "/ticker"
This allow us to share more code between Office and Google plugins (the providers objects are the same and only the REST call functions are different). These bindings will allow us to keep track of certain cells and modify their content on the fly. This match our need but require more work that the Google version. 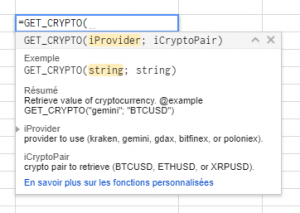 To create this object, we will allow the user to pick an exchange and crypto in the plugin menu and then click on a cell and bind all the info together. For example: (UniqId;”gemini”,”BTCUSD”). Then we will add a button to go through all the existing bindings in the sheet and refresh them all. The key here is that we retrieve the binding from the document using its unique ID and then use the info we have about it (exchange/crypto) to update its current value. I will not detail too much the layout creation (standard JS/HTML with the ngofficeuifabric plugin). You can still have a look at it in the plugin repo. Now we have a way to bind a cell to an exchange/crypto and update its value when the user presses a button. This is already some pretty good results but one thing is missing: Saving this information! The bindings are save by office in the document so we do not need to do anything about them. Nevertheless, we created new objects that associate these bindings with our plugin info (crypto/exchange/Ref binding). We need to save these data so that the user can access them again when the document is close/open. One solution would be to save them on the server side since we have to had a server for office plugin. I do not like this solution since it would lead to more work on our side and would preferer if we could “inject” our data in the document and let MS save it for us. Note that the “persistSettings()” is just calling “Office.context.document.settings.saveAsync” to ensure the data are persisted when the document is closed. I did not do any automated tests for the office plugin. 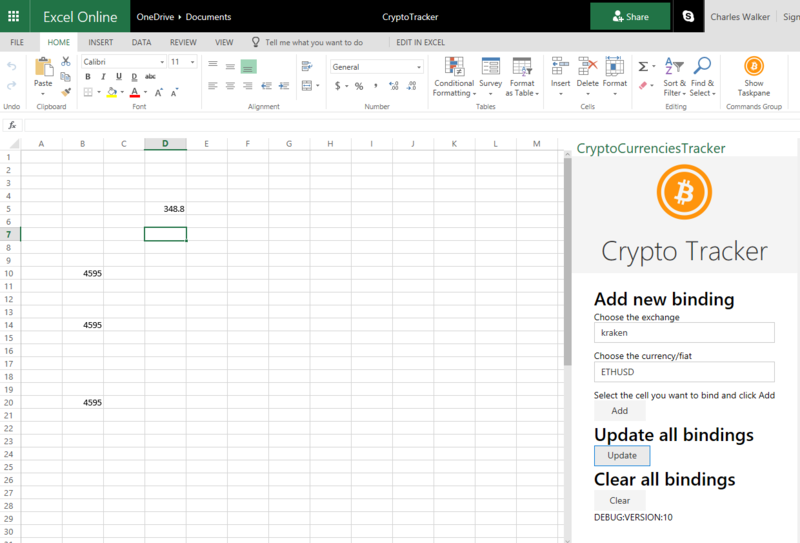 I just test it live in one spreadsheet. 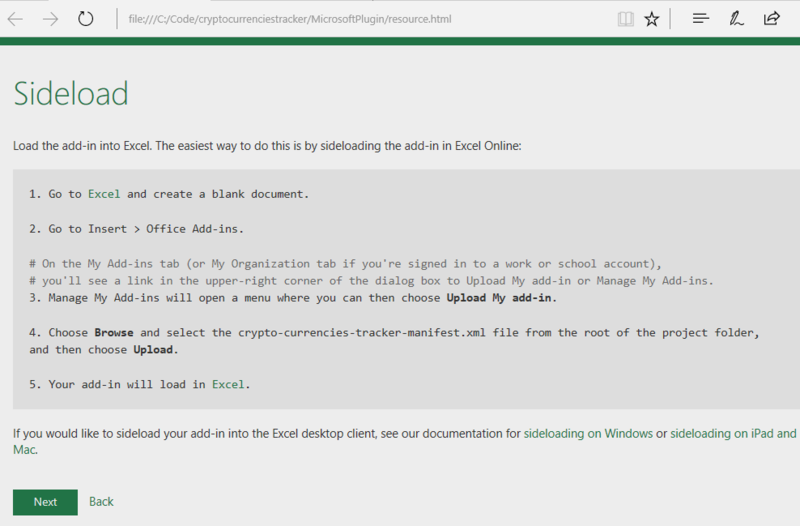 It is fairly easy to test the plugin with office online since it allows to upload a manifest on the fly. I did not publish it require to host my application on a dedicated webserver. I do not want to pay for hosting and will not take time to update it. It was a really interesting experience to develop this plugin for the 2 biggest platforms. Both of them choose to use JS for the language with different approach. 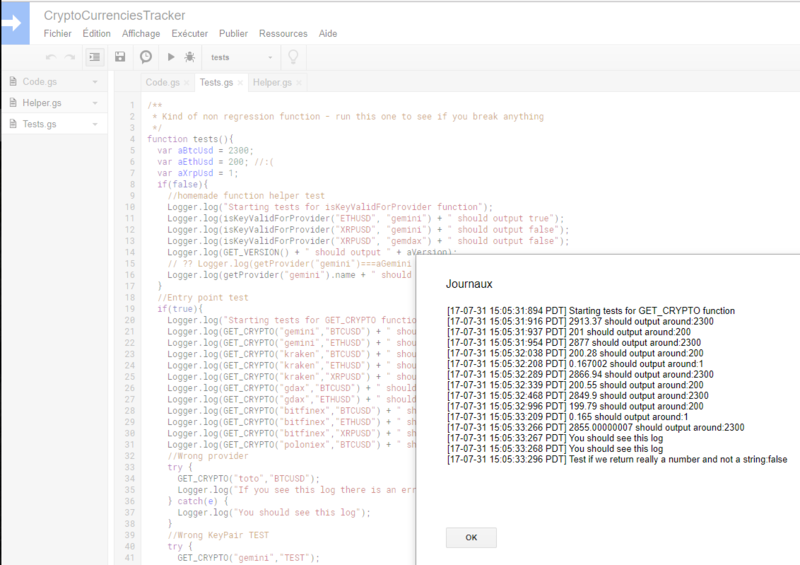 The Google way is simpler with the online IDE/Code hosting but maybe be more limited for complex project. Microsoft experience was more painful due to the time to setup all the environment and also it requires you to host your plugin. This is a big NOGO for me since I do not want to spend too much time on it and I think it explains why there are much more plugin for Google suite. 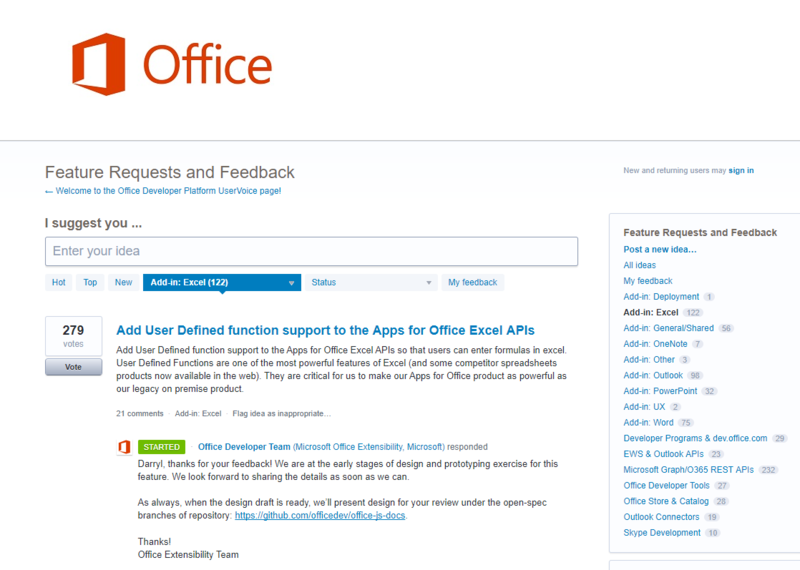 I also think MS should listen to the developer community and work on the “User defined function” since it is currently the most request feature and offer by Google. I decided to create a plugin to retrieve the value of a cryptocurrency pair from Google Spreadsheet. I wanted to learn more about google spreadsheet plugin process and its internal. This was fairly enough and then I challenge myself to do the same for Microsoft Online Excel. This first article will explain the Google plugin creation with a focus on the whole flow and Developer experience. 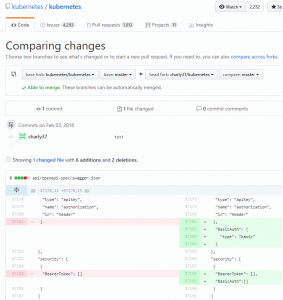 I will details/compare the Microsoft plugin creation in another article with again a focus on developer experience. To create a plugin for a Google sheet you need to create a google sheet and then use its “script editor” section to write the plugin. It was a little surprising and I had to do some research to be sure I was properly understanding the process. 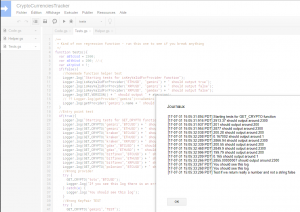 Luckily it is fairly simple to enhance the list of function in google sheet with the use of a special JSdoc keyword in the function documentation. This is clearly documented by google HERE thus, I will not detail it too much. Then I created several objects that represents various crypto currency exchange so that the user can choose which one he wants to use to retrieve the value. All these “exchange” object exposes various functions to create the URL to call and to decode the response. This design allows a main function to do the URL rest call and then let the “exchange” object parse the response. All the code is available on bitbucket HERE and fairly easy to follow. Once the plugin is ready it can be published on the Google chrome store. This was very confusing for me but it appears that google suite plugins are publish on the google chrome store (but it seems they are only visible when you browse the store from a google document). 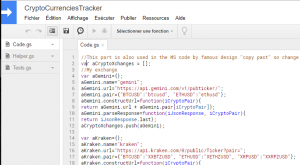 To publish you will need to register as a chrome developer and pay 5$. This was also surprising since I’m already register in the google play store but the 2 stores are completely decorrelated (even the publication flow are different). The process was easy thanks to the integrated IDE nevertheless the publication flow is strange (especially because it is different of what I was used too with the android store). The documentation is good although some part is unclear (the publication part… again). Code is very simple especially thanks to the very easy way to create new “custom functions”. 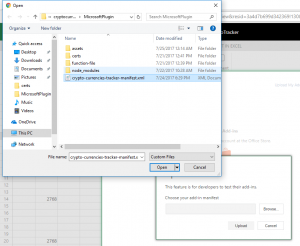 The Microsoft plugin will be detailed in another article. I‘m working in an openspace of 15 peoples and most of us are very cold. There is one thermostat for the whole openspace with the actual temperature display on it but it seems we cannot change the desired temperature… We complain several times to our management about it and after some time the responsible of the amenities comes and explains us the situation. 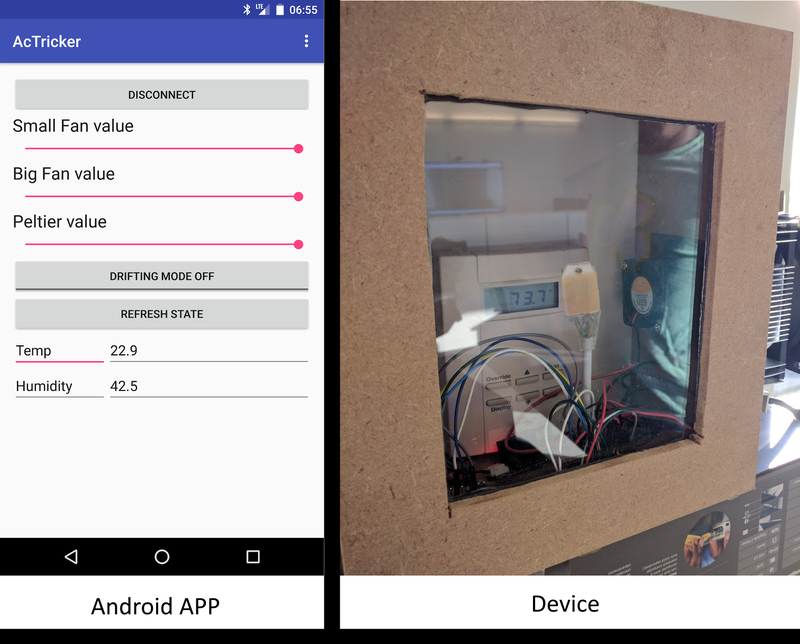 The temperature is set by the landlord for the whole building and the sensor in our openspace is just to detect the temperature in our space to open air vent or not. In other word…there is nothing they can do about it, is it? It’s design to be put against the wall around the temperature sensor. 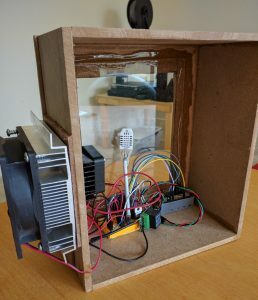 It will create a cold micro climate around the sensor to trick it thinking that the office is cold and thus never start the AC in our openspace. 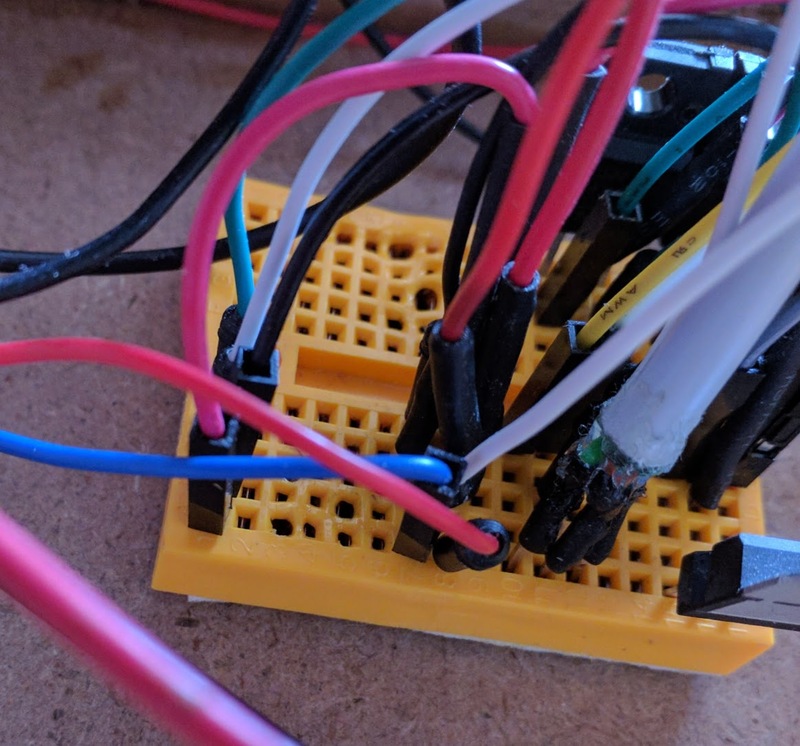 It works with a Peltier device that generate cold inside the enclosure and Hot outside of the enclosure when a current is passing (I did not research how/why it is work but just use it as is). 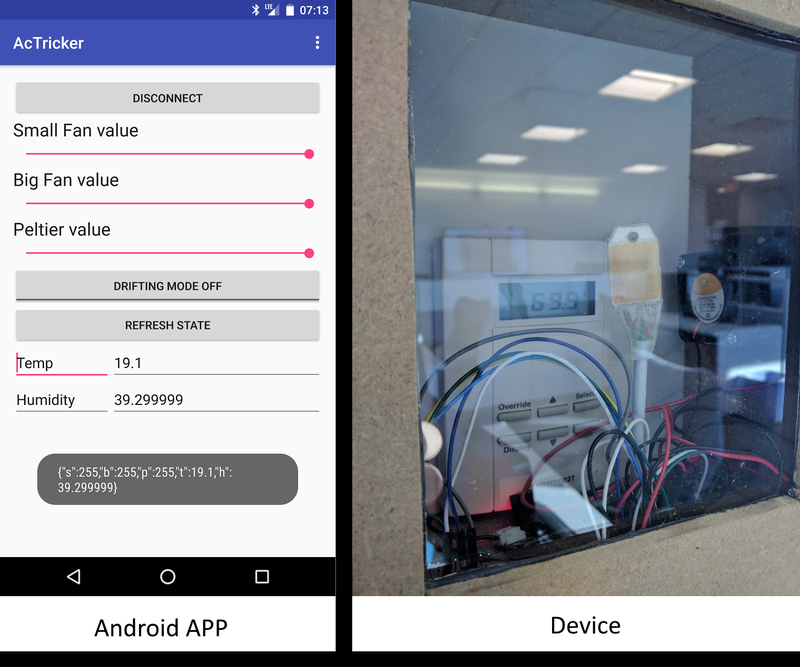 The whole system is control with an android application with Bluetooth so people can check what is the simulated temperature inside the enclosure and act on it by stopping the Peltier device and fans. The brain of the whole system on the device side is an Arduino micro (small size). 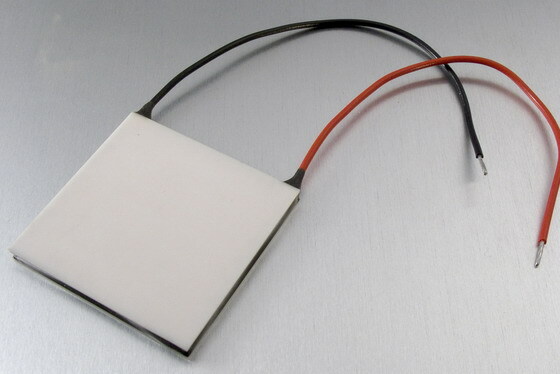 It is connected to a Bluetooth modem and a temperature/humidity sensor (DHT22/RHT03) for data exchange. There is also 2 MOSFET to control the fans and 1 static relay to control the Peltier device. Code is on my bitbucket repo. 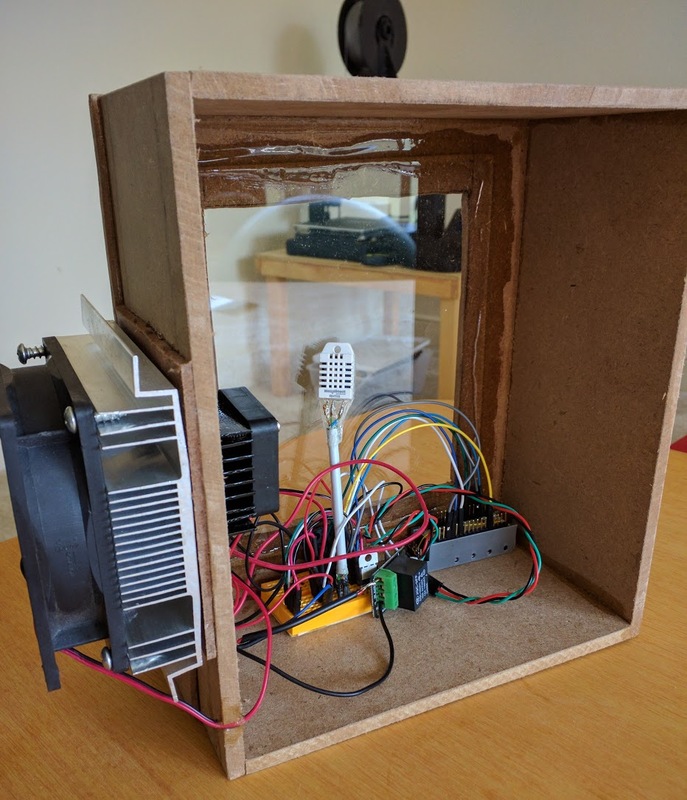 Improvement idea: Have the Arduino automatically stopping the Peltier/fan when the temperature inside is low enough to save power and reduce noise. 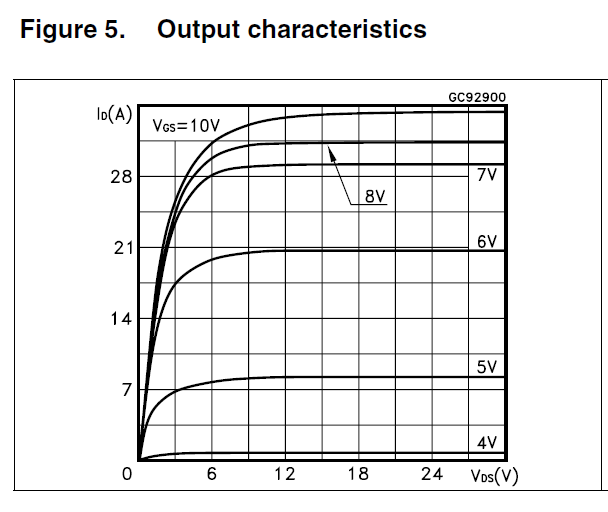 As you can see if we switch the Gate voltage from 5V to the recommended 10V the current we can drain grow from 7A to more than 28A. 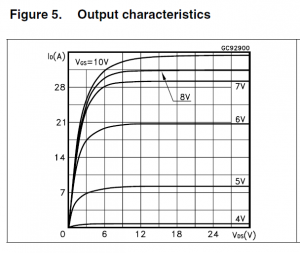 This is why the MOSFET was become too hot and unusable. I should have bought a MOSFET design to be driven with a gate voltage more compatible with Arduino like the IRL540. Last week I had to generate a SSL certificate for a domain which has its web server on a corporate network. The Web Server on the corporate network has outgoing internet access but cannot be reach from Internet. I was not sure it was possible to generate a certificate in this case with let’s encrypt since my previous experience was with a Web server reachable from internet to answer the let’s encrypt challenge (http://djynet.net/?p=821). Luckily I was wrong 😉 It is indeed possible to prove let’s encrypt that you own the domain with a DNS challenge! Here are my notes on how to do it. 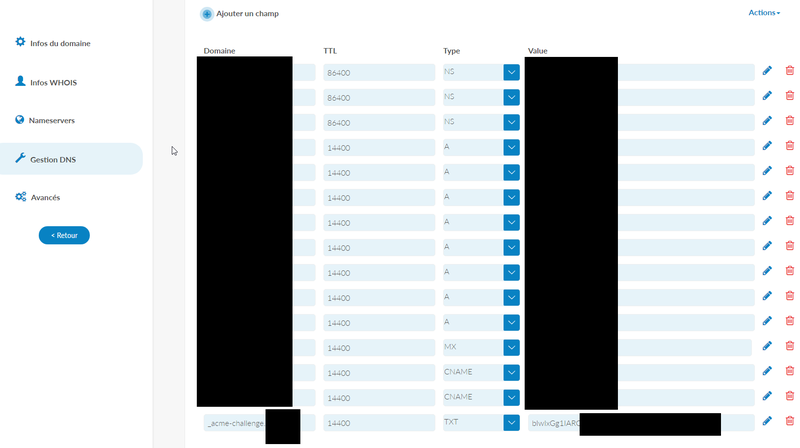 All set 😉 Pretty easy and very nice feature to validate a Webserver not connected to internet (as long as you have access to its DNS server and it is reachable from internet). Note : Similar to AngularUI and FondationUI but based on another framework. I recently come across a project where I needed to interact with some RFID tag. I wanted to retrieve the Unique ID of the each badge. I had absolutely no information on the badge except the string “HID iClass” written on it. I start doing some research and found out that there are 2 big frequencies used in RFID: 125 kHz and 13.56 MHz. The iClass seems mainly based on the 13.56 MHz standard so I decided to go for a reader on this frequency. I set it up with a Raspberry Pi 2 and was able to read the TAG send with the reader but sadly not the tag I wanted to read… Since I was unable to read my tag I guess they are using the third protocol: ISO 15693. I look for some reader for the ISO 15693 but the choice is very limited (since it is not widely use). In the meantime I found a cheap HID reader on amazon (https://www.hidglobal.fr/products/readers/omnikey/5321-cli) which should be compatible with HID iClass card so I decided to buy it. Moreover there is a USB standard for such device: CCID. 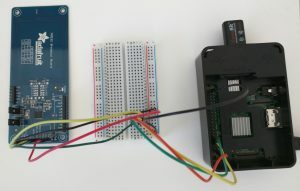 This package provides the source code for a generic USB CCID (Chip/Smart Card Interface Devices) driver and ICCD (Integrated Circuit(s) Card Devices). 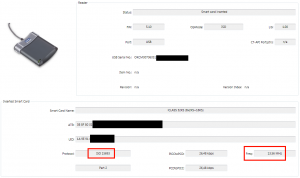 Middleware to access a smart card using SCard API (PC/SC). pcscd is the Linux daemon to access readers compatible with the PC/SC standard. 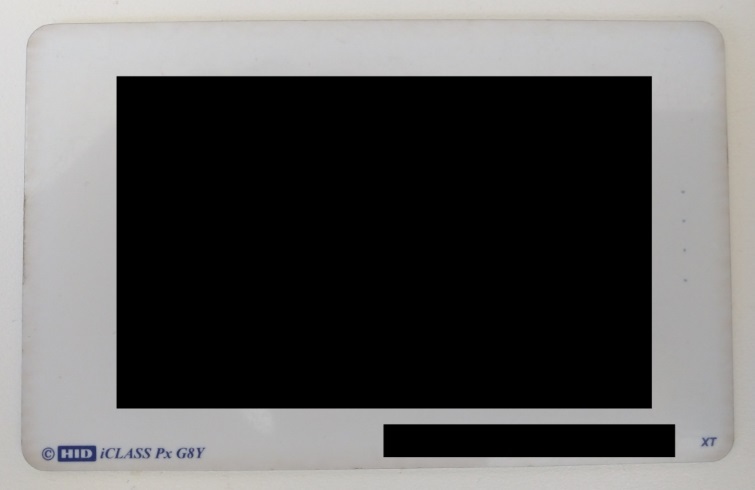 OpenSC provides a set of libraries and utilities to work with smart cards. After I installed the driver/daemon and the tools to interact with the reader I had trouble since the reader was not detected by pcscd. Luckily there is a section “Check reader’s compliance to CCID specification” on the pcsc page to know if the driver is supported. 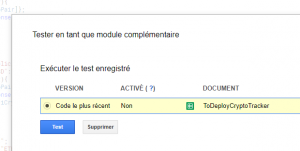 I follow it and send the repport to the main maintainer of pcsc driver: Ludovic Rousseau. Then (re)install the CCID reader and try again to use the reader. The conclusion is that this reader is not CCID compliant. I am not surprised by this result. You have to use the proprietary driver and no driver is provided for RaspberryPi. I will try to see if I can interact with the reader and libusb and also found a cheap open source ISO 15693 reader to continue this project. I contact Omnikey to have support to use their reader for my project and they confirmed there is no driver on the Pi for it. we don’t have any drivers for 5321 CLi on Raspberry Pi. Please have a look at OMNIKEY 5022 or OMNIKEY 5427 CK instead. The can be accessed through native ccidlib. timing are not respected . We have already implemented a triccky commannd which allow us to support Picopass , a new version of CR95HF devevelopment softaware will be soon available including a dedicated window for PICOPASS . After 3 readers and countless hours of attempt I’m still unable to read the iClass badges since they do not seems to implement any real standard.